Treatment with the fluoroquinolone class of antibiotics has become increasingly popular. Clinician preference for quinolones stems from their excellent gastrointestinal absorption, superior tissue penetration and broad-spectrum activity.1,2 However, this has led to widespread and indiscriminate use, affecting microbial resistance patterns and increasing drug-related morbidity.3 Although quinolone-induced tendonopathy and tendon rupture have been previously described in the literature, reports of tendon rupture in association with newer quinolones such as levofloxacin are now emerging.4,5 We describe a patient with levofloxacin-induced partial rupture of the Achilles tendon and review the literature, pathophysiology, predisposing factors, and treatment recommendations. An 88-year-old man was admitted with a recurrent draining abdominal abscess. A dye study confirmed an enterocutaneous fistula for which a right colon resection was performed. Past medical history included hypothyroidism, parkinsonism, dementia, osteoporosis, and prostate cancer previously treated with leuprolide. Medications at admission included levothyroxine, carbidopa/levodopa, donepezil, alendronate sodium, calcium, fludrocortisone, baby aspirin, and vitamin E.
Oral levofloxacin, 500 mg/day, was initiated 5 days before admission. After surgery, the patient received 500 mg of intravenous levofloxacin daily with cefazolin for 5 days and then was continued on daily oral levofloxacin at the same dosage for an additional 5 days. Discomfort in the left ankle was noted 2 days after the initial dose of levofloxacin and progressed throughout the peri- and post-operative period. One week after discharge, he presented to the emergency department with mild, nonpitting edema of the left calf and ankle, and pain on plantar flexion. No Homan sign could be elicited. A Doppler study failed to detect a thrombus, and there was no radiologic evidence of a fracture. The patient was diagnosed with a muscle strain and discharged from the hospital with a prescription for 100 mg of celecoxib twice per day for pain and 20 mg of furosemide per day for edema. Two weeks later, he was re-evaluated in the emergency department because of severe left leg pain, increased edema, erythema, and warmth extending to the knee, with tenderness on palpation of the Achilles tendon. A second Doppler study was negative, and the patient was admitted for a presumed cellulitis that resolved rapidly on intravenous cefazolin. However, he continued to complain of ankle pain on weight bearing. We suspected a quinolone-induced tendonopathy, so magnetic resonance imaging (MRI) was performed, which confirmed a 2-cm segment of partial tearing of the Achilles tendon, approximately 4 cm above the calcaneal insertion with surrounding soft tissue edema (Figure 1). Because the patient was not a good surgical candidate, a below-the-knee ankle-foot orthosis was applied for 3 months. He received regular physical therapy while remaining non-weight-bearing at home. Full recovery ensued without any sequelae of tendonopathy. 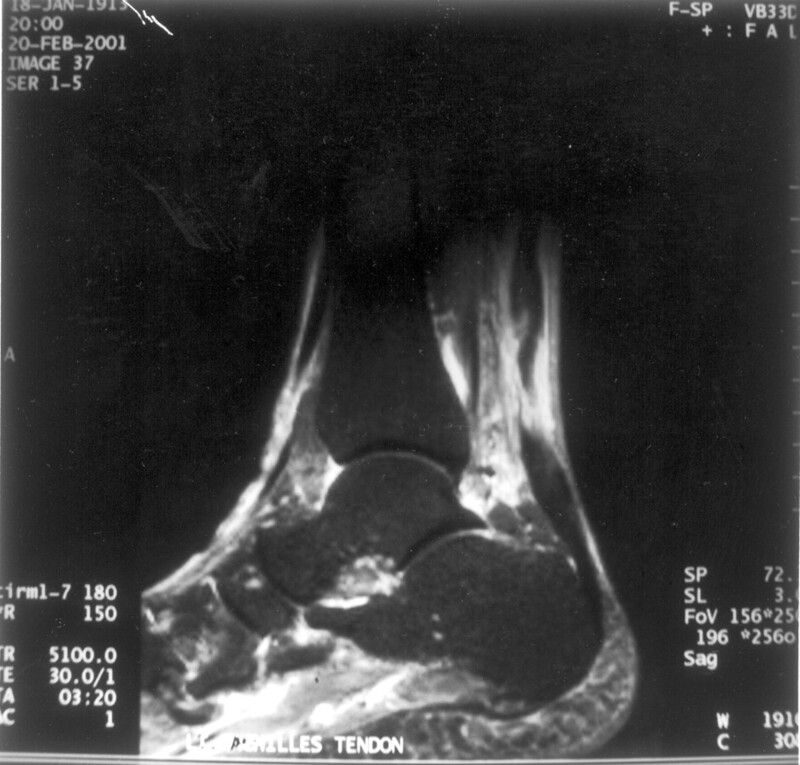 MRI of a 2-cm segment of an Achilles tendon partial tear, 4 cm above the calcaneal insertion with surrounding soft tissue edema. Risk factors for tendonitis/tendon rupture are emerging from postmarketing surveillance. The most commonly reported risk factors are concomitant steroid therapy and renal insufficiency.4,10,11,17 Other conditions that may predispose a patient to a quinolone-related tendon rupture include advanced age, prior tendonopathy, magnesium deficiency, hyperparathyroidism, diuretic use, peripheral vascular disease, rheumatoid arthritis, diabetes mellitus, and strenuous sports activities.1,11,18 The patient in this case report noted symptoms of tendonitis within days after oral levofloxacin was initiated. MRI confirmed the diagnosis of tendon rupture 3 weeks later. His risk factors included advanced age, steroid therapy, a brief course of diuretics, and prolonged exposure to levofloxacin. The deleterious effects of fluoroquinolones on tendons have been documented since the 1980s. A concomitant rise in tendon rupture incidence has been observed during this same time span.19,20 With the increasing use of levofloxacin and other quinolone antibiotics, we should expect to encounter a growing number of patients experiencing tendonopathy. Patients presenting with joint tenderness and swelling, especially those in a high-risk category, should be questioned as to quinolone use dating as far back as 6 months or more. Discontinuation of the medication and immobilization of the affected joint should be foremost. Preventative measures include avoiding indiscriminate use of quinolones, recognition of risk factors, and adherence to renal dosing. Finally, an emphasis on patient awareness can further reduce the morbidity associated with quinolone-induced tendonitis and/or rupture by prompting earlier presentation, evaluation, and intervention. We are grateful to Michael Gold, MD, and Luis Gruberg, MD, for their editorial assistance. Received for publication February 13, 2003. Revision received February 13, 2003. Zabraniecki L, Negrier I, Vergne P, et al. Fluoroquinolone induced tendinopathy: report of 6 cases. J Rheumatol 1996; 23: 516–20. Physicians’ desk reference. Montvale, NJ: Medical Economics Co, 56th ed, 2002. Levaquin, p. 2537–43. Davidson R, Cavalcanti R, Brunton JL, et al. Resistance to levofloxacin and failure of treatment of pneumococcal pneumonia. N Engl J Med 2002; 346: 747–50. Weller S. Minerva. BMJ 2002; 324: 554. Kahn JB. Latest industry information on the safety profile of levofloxacin in the US. Chemotherapy 2001; 47 Suppl 3: 32–7; discussion 44–8. Casparian JM, Luchi M, Moffat RE, Hinthorn D. Quinolones and tendon ruptures. South Med J 2000; 93: 488–91. McGarvey WC, Singh D, Trevino SG. Partial Achilles tendon ruptures associated with fluoroquinolone antibiotics: a case report and literature review. Foot Ankle Int 1996; 8: 496–8. Bailey RR, Kirk JA, Peddie BA. Norfloxacin-induced rheumatic disease [letter]. N Z Med J 1983; 96: 590. McEwan SR, Davey PG. Ciprofloxacin and tenosynovitis [letter]. Lancet 1988; 2: 900. Harrell RM. Fluoroquinolone-induced tendinopathy: what do we know? South Med J 1999; 92: 622–5. van der Linden PD, Sturkenboom MC, Herings RM, Leufkens HG, Stricker BH. Fluoroquinolones and risk of Achilles tendon disorders: case-control study. BMJ 2002; 324: 1306–7. Gabutti L, Stoller R, Marti HP. Fluoroquinolones as etiology of tendinopathy. Ther Umsch 1998; 55: 558–61. Huston KA. Achilles tendinitis and tendon rupture due to fluoroquinolone antibiotics [letter]. N Engl J Med 1994; 331: 748. Jorgensen C, Anaya JM, Didry C, et al. Arthropathy with Achilles tendon involvement induced by pefloxacin. Apropos of a case. Rev Rhum Mal Osteoartic 1991; 58: 623–5. Williams RJ, Attia E, Wickiewicz TL, Hannafin JA. The effect of ciprofloxacin on tendon, paratenon, and capsular fibroblast metabolism. Am J Sports Med 2000; 28: 364–9. Bernard-Beaubois K, Hecquet C, Hayem G, Rat P, Adolphe M. In vitro study of cytotoxicity of quinolones on rabbit tenocytes. Cell Biol Toxicol 1998; 14: 283–92. Shakibaei M, de Souza P, van Sickle D, Stahlmann R. Biochemical changes in Achilles tendon from juvenile dogs after treatment with ciprofloxacin or feeding a magnesium-deficient diet. Arch Toxicol 2001; 75: 369–74. Leppilahti J, Puranen J, Orava S. Incidence of Achilles tendon rupture. Acta Orthop Scand 1996; 67: 277–9. Maffulli N, Waterston SW, Squair J, Reaper J, Douglas AS. Changing incidence of Achilles tendon rupture in Scotland: a 15-year study. Clin J Sport Med 1999; 9: 157–60.